The Supreme Court of Canada released a ruling in the case of Crookes v. Newton, 2011 SCC 47, which clarifies the law that hyper-linking to an article on the internet is not defamation. This is a good sign from the Supreme Court of Canada that they are taking freedom of speech seriously and as a bed-rock right to Canadian values. OTTAWA — Simply posting a hyperlink to defamatory information does not in itself constitute publication, the Supreme Court of Canada ruled Wednesday, effectively upholding lower court rulings in B.C. In a slightly nuanced, albeit unanimous ruling, the high court found the defamatory material can only be considered published when the hyperlinker actually repeats the defamatory content. The case involves Wayne Crookes, a B.C. businessman and Green Party member who argued a smear campaign had been mounted against him. He sued a number of parties for defamation and asked Jon Newton, who owns and operates a website focused on Internet and free speech commentary, to remove a pair of hyperlinks that connected users both directly and indirectly to some of the allegedly defamatory material. Both the trial judge and B.C. appeals court ruled hyperlinks were like footnotes or references and not a republication of material. OTTAWA - Creating an online link to defamatory content created by someone else does not constitute publishing that content. In a decision that could have chilled the way the Internet works, the Supreme Court of Canada ruled that bloggers and Twitter users are not breaking the law by merely linking to another site that contains libelous or defamatory material. "The Internet, in short, cannot provide access to information without hyperlinks," wrote Justice Rosalie Abella. "Limiting their usefulness by subjecting them to the traditional publication rule would have the effect of seriously restricting the flow of information and as a result, freedom of expression." While the decision was unanimous, two justices warned that framing or endorsing the link as the truth or accurate could still land an Internet linker in court. "Combined text and hyperlink may amount to publication of defamatory material," wrote Chief Justice Beverly McLachlin and Justice Morris Fish. "If the text communicates agreement with the content linked to, then the hyperlinker should be liable for the defamatory content." The case stems from a dispute in British Columbia where Wayne Crookes claimed he was defamed by two different links on site run by Jon Newton. Civil Liberties organizations, Internet advocates and media lawyers all argued against Crookes, saying outlawing linking would hobble the pace of information online. Both the B.C. Supreme Court and the B.C. Court of Appeal ruled that simply making a link does not endorse or publish the original defamatory material. The Supreme Court Wednesday upheld those lower court decisions. 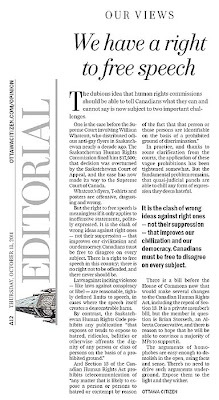 The Ottawa Citizen has a good editorial on the important right to free speech. This is the same right, which the fanatics at the Canadian Human Rights Commission dismiss as "an American concept". The dubious idea that human rights commissions should be able to tell Canadians what they can and cannot say is now subject to two important challenges. One is the case before the Supreme Court involving William Whatcott, who distributed odious anti-gay flyers in Saskatchewan nearly a decade ago. The Saskatchewan Human Rights Commission fined him $17,500; that decision was overturned by the Saskatchewan Court of Appeal, and the case has now made its way to the Supreme Court of Canada. Whatcott's flyers, T-shirts and posters are offensive, disgusting and wrong. But the right to free speech is meaningless if it only applies to inoffensive statements, politely expressed. It is the clash of wrong ideas against right ones - not their suppression - that improves our civilization and our democracy. Canadians must be free to disagree on every subject. There is a right to free speech in this country; there is no right not to be offended, and there never should be. Laws against inciting violence - like laws against conspiracy or libel - are reasonable, tightly defined limits to speech, in cases where the speech itself creates a demonstrable harm. By contrast, the Saskatchewan Human Rights Code prohibits any publication "that exposes or tends to expose to hatred, ridicules, belittles or otherwise affronts the dignity of any person or class of persons on the basis of a prohibited ground." And Section 13 of the Canadian Human Rights Act prohibits telecommunication of "any matter that is likely to expose a person or persons to hatred or contempt by reason of the fact that that person or those persons are identifiable on the basis of a prohibited ground of discrimination." In practice, and thanks to some clarification from the courts, the application of these vague prohibitions has been tightened somewhat. But the fundamental problem remains, that quasi-judicial panels are able to chill any form of expression they deem hateful. There is a bill before the House of Commons now that would make several changes to the Canadian Human Rights Act, including the repeal of Section 13. It is a private member's bill, but the member in question is Brian Storseth, an Alberta Conservative, and there is reason to hope that he will be able to convince a majority of MPs to support it. The arguments of homophobes are easy enough to demolish in the open, using facts and sense. There's no need to drive such arguments underground. Expose them to the light and they wither. Canadian "Human Rights" Commission slammed in New Zealand. The Canadian Human Rights Commission has become an international embarrassment. Newspapers as far away as New Zealand are slamming the CHRC and their censorship track record. OPINION: You will probably be surprised to learn that I sport a tattoo on my right shoulder, acquired during the course of an impulsive adolescence. While I do not deny being partly motivated by the desire to impress a girl, the form of the tattoo a clairseach, or Irish harp was intended as a nod to my Irish ancestry. Despite my Easter Uprising name, my roots in this country stretch back five generations. I can scarcely claim to be Irish in any meaningful way. The tattoo was a symptom, I think, of that yearning for heritage, for whakapapa, which affects the descendants of settlers worldwide. All people are hard-wired to honour their ancestors. Despite consciously putting such navel gazing behind me, I have not had the tattoo removed. I probably never will. It is literally a part of me and, if nothing else, serves as a useful reminder of the indelible consequences acting on temporary passions can sometimes have. Someone who understandably felt much more strongly about a more authentically ethnic tattoo was Claire Haupini, who was a causal worker for Spit Roast Catering Company in Auckland. Mrs Haupini has a moko that runs along her left arm and is a motif of her Iwi heritage. When her employer required she wear a long-sleeved uniform (also worn by other female staff members), she became upset that it covered the moko. In years gone by, Mrs Haupini would have had two options. The first would be to cover her moko while working and the other would be to seek employment elsewhere. Today, however, there is a third option: complain that your human rights have been breached. Ms Haupini, represented by the Human Rights Commission, took the matter to the Human Rights Review Tribunal. After a three-day hearing, the claim was decisively dismissed. The tribunal agreed, in essence, that the company had not discriminated against Mrs Haupini as a Maori, but as a tattoo wearer (not a protected ground under the Human Rights Act) and agreed that any tattoo wearer in the employ of the company would have received the same request. This was the right outcome and a commonsense decision. We are conditioned to respond positively to the language of human rights, but the reality is that the ideal of human rights can easily be appropriated as a tool of oppression. Nowhere is this more the case than in Canada where human rights law has been outed in recent years as a vehicle for activists to inflict illiberal punishments on those with whom they disagree. In the name of promoting equality, the various Canadian human rights enforcement agencies have tilted their procedures strongly towards convictions. Parties not involved in the alleged offences, for instance, may file complaints. Standards of proof are relaxed in such a way that denies natural justice and procedural fairness to defendants, who receive no government funding despite the fact that plaintiffs were fully funded. 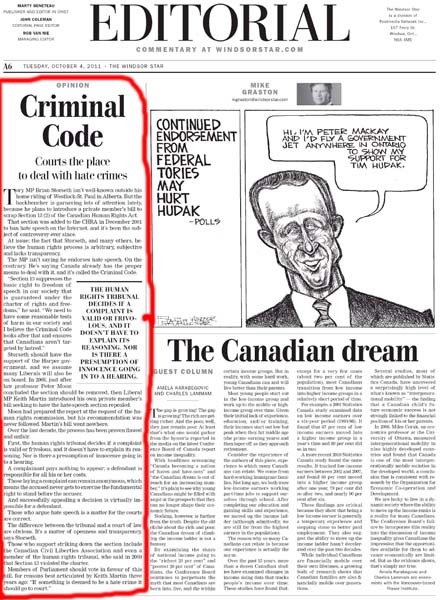 Truth is no defence to allegations of hate speech and on this score, the Canadian Human Rights Commission boasted until recently a conviction rate of 100 per cent a record unmatched even by Joseph Stalin's show trials. Perhaps most outrageously, some remedies included plaintiffs being forced to make confessions and recantations of their opinions. One Alberta pastor who was forced to renounce his beliefs also received a lifetime speech ban on the subject of gay marriage, including in sermons and private emails. That this should be allowed to occur in what is usually considered to be a free country is a disgrace. That much of New Zealand's human rights law is modelled on Canada's, and that Canadian human rights jurisprudence is usually praised in the nation's law schools, should give pause for concern. Since 2002, for example, the Human Rights Commission, via the Office of Human Rights Proceedings, has been empowered to provide ``free'' (i.e. taxpayer funded) legal representation to selected plaintiffs. So despite winning, the company is up for a reported $40,000 in legal fees, not to mention the time and effort expended in fighting the claim. Mrs Haupini, by contrast, pays nothing. The company reports that the commission offered it a $10,000 settlement to end the claim. Faced with such an opponent, how tempting would it be to settle rather than to persevere with vindicating your rights? There are many celebrated figures in the history of the law who incurred great cost in the course of defending unmeritorious claims on a matter of principle. We owe these people a debt. Ordinary people and businesses, however, can seldom afford such vindication. Reportedly, Spit Roast Catering Company will now seek to recover some of its costs from the Human Rights Commission. Although I am not sure that the law will permit such an action, I am confident justice demands it. * Liam Hehir is a lawyer at Palmerston North firm Fitzherbert Rowe. "Section 13 suppresses the basic right to freedom of speech in our society that is guaranteed under the charter of rights and freedoms," he said. "We need to have some reasonable tests of harm in our society and I believe the Criminal Code looks after that and ensures that Canadians aren't targeted by hatred." Storseth should have the support of the Harper government, and we assume many Liberals will also be on board. In 2008, just after law professor Peter Moon concluded the section should be removed, then Liberal MP Keith Martin introduced his own private member's bill seeking to have the hate-speech section repealed. Moon had prepared the report at the request of the human rights commission, but his recommendation was never followed. Martin's bill went nowhere. Over the last decade, the process has been proven flawed and unfair. First, the human rights tribunal decides if a complaint is valid or frivolous, and it doesn't have to explain its reasoning. Nor is there a presumption of innocence going in to a hearing. A complainant pays nothing to appear; a defendant is responsible for all his or her costs. Those laying a complaint can remain anonymous, which means the accused never gets to exercise the fundamental right to stand before the accuser. And successfully appealing a decision is virtually impossible for a defendant. OTTAWA - Calgary Bishop Fred Henry has come out in support of a bill introduced by a Conservative MP that would strike the controversial Section 13 from the Canadian Human Rights Act. Brian Storseth introduced Bill C-304, An Act to amend the Canadian Human Rights Act (CHRA) into the House of Commons Sept. 30. The bill would repeal Section 13 as well as section 54, the penalty clause associated with it. Henry believes he was actually the aggrieved party when charges were levelled against him. “I believe that the complaints that were lodged against me were an attempt to intimidate and silence me, and in point of fact, the lodging of these complaints constituted a violation of my right of freedom of expression and freedom of religion guaranteed by the Charter of Rights and Freedom, and has revealed a multitude of problems with the Alberta Human Rights Commission and its processes,” the bishop said. The complaints were eventually dropped. The bishop also objected to the process human rights commissions employ when people face complaints under these sections. “Based on my experience, it is not difficult to point out a number of imbalances and flaws in (rights commissions’) current operations such as the presumption of guilt until you can prove your innocence, the open-ended time lines for dealing with a complaint and unjust incurring of financial expenditures for the defendant in the simple event of a complaint being lodged,” he said. After five years in power, the Conservative government finally has introduced a bill to repeal the censorship provision of the Canadian Human Rights Act. So it covers a Facebook link that you share that has an off-colour joke. Or a comment that you make on a blog that isn’t quite politically correct. Finally, the Conservative government has taken the first baby step to repealing it. Well, that’s not quite accurate. The Conservative government and the Justice Minister haven’t done a thing. But a backbench MP from the northern Alberta riding of Westlock-St. Paul has. Last Friday, Brian Storseth introduced a private member’s bill, Bill C-304, called “An Act to Amend the Canadian Human Rights Act (Protecting Freedom).” Normally when a private member’s bill is introduced, it’s merely a symbolic act — pretend busy-work that’s little more than a press release, that has little chance of being passed, and often doesn’t even get a chance to be debated. But Storseth’s C-304 isn’t at the end of a long line. It’s near the front — it’s 15th in line. So it’s quite likely that the bill will actually be debated, as soon as November, and voted on this year. It should be a slam-dunk. Freedom of speech is so important to our society, it’s bigger than left wing versus right wing, or conservative versus liberal. During the Conservatives’ two terms of minority government, they were afraid of offending the small group of Canadians who make their living by being professionally offended by things. Literally a thousand lawyers and bureaucrats across Canada collectively take about $200 million from taxpayers to “work” in human rights commissions. And then there are all the lawyers-of-fortune and other shakedown artists and hangers-on out there who don’t work directly for the industry, but who have a stake in it. Of course these censors have a political agenda of their own. They don’t believe in diversity — diversity of opinion, that is. All the people prosecuted by the Canadian government under section 13 fit a pattern. To use the language of the complaining left, the human rights commission engages in racial profiling. One hundred per cent of the people prosecuted under section 13 have been white and Christian. And 90% of them have been too poor to afford a lawyer. Abolish the "Human Rights" Commissions! They are nothing but censors and out of control government politically correct enforcers.